Renowned artist B Prabha and the purchase of her paintings marked the beginning of Air India’s illustrious years of art collecting. 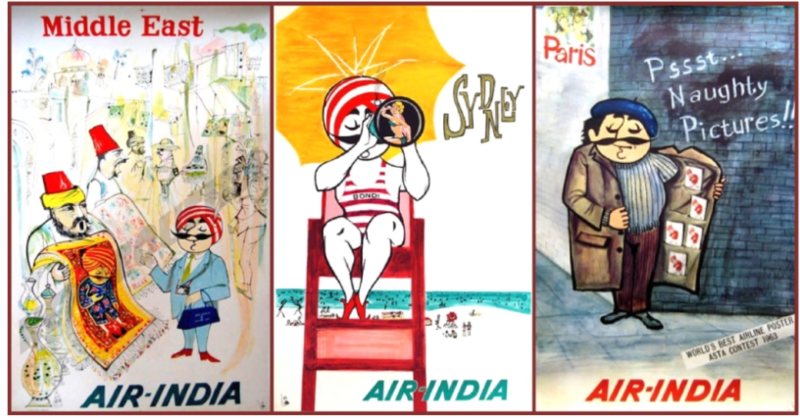 The fascinating history of Air India’s collection of art dates back to the year 1956. A young graduate of Mumbai’s JJ School of Art approached the Air India’s art department and proposed the company to buy some of her paintings of Indian women and the officials there agreed. The artist was the now well-known B Prabha, and her paintings include the works of legends such as MF Husain and VS Gaitonde. Eventually, the artworks were printed on the menu cards distributed among the passengers. They would even go on to decorate the airline’s booking office in London, a trend that spread to its outposts across the world. Moreover, between 1956 and the mid-2000s, the company also obtained scores of textiles, sculptures, wooden carvings, glass paintings, and other objects- all of which it used in order to present India to the world as a society steeped in culture. Apart from B Prabha, Air India has accumulated over four thousand paintings by artists such as KA Ara, Anjolie Ela Menon, Arpana Caur. 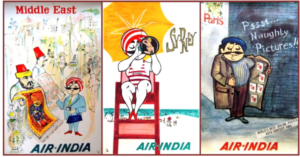 The airline also has a collection of sketches that were made exclusively for it by renowned Goan cartoonist Mario Miranda. There are stone sculptures dating back to the ninth century, woodwork, decorative friezes, a collection of exquisite clocks. There is also a costume collection called ‘Paridhanika’, comprising Kanjeevaram, Paithani, Baluchari sarees as well as patolas, pashminas and dresses showcasing intricate zardozi work. Uttara Parikh, who spent over 30 years at the company after joining its advertising department in 1967 said, “At that time, Air India was one of the few airlines from part of the world.” Having competitors like American Airlines, Air India needed to find a way to stand out. “The way we could be different and what nobody could copy was to be Indian. So Indian art became a vehicle for promoting out Indian-ness,” she added. By the year 1960, under the leadership of founder JRD Tata, Air India had its celebrated days. They began maintaining a detailed, handwritten register for all their items, sent paintings by Indian artists to hang behind the counters at its rising booking offices around the world. Sometimes, they would even send over artists to paint murals there and would offer flight tickets in exchange for paintings. Perhaps the most exceptional step was the introduction of the quirky ashtrays it commissioned from surrealist master Salvador Dali, which it gifted to a few hundred lucky first-class passengers. By the 2000s, the company had a downfall and their losses were mounting. Currently, the national carrier is drowning in debt, after over a decade of its partnership with Indian Airlines. Amidst all the chaos, the fate of the company’s historic art collection is up in the air, though in the year 2017 there were ongoing plans to establish an Air India museum. “The Air India collection is not just a 100 pieces of the finest artists’ paintings. There is of course oil on canvas and acrylic on canvas, but the story doesn’t end there,” said art historian Meera Dass. “There are also calendars, posters, and diaries featuring the work of iconic Indian artists and photographers of the 1950s, 1960s and 1970s, not to mention an enormous collection of rare textiles. Every piece has a story behind it,” she added. Hence, in order to store the valuable artworks of the company, it was decided that Air India deserved a museum of its own, which was to be located over 20,000 sq ft of the Nariman point building in Mumbai and a tender was issued in 2017. But as the year 2018 rolled in the tide turned. Air India’s managing director changed and the Indian government’s plans to privatise it were in full swing, stalling the eagerly-anticipated museum. Apart from the historic story of the collections of paintings and art, it is the story of a legendary company and its lost aesthetic sensibility.